For the Sunday morning service we were a part of a program called "Windows on our Journey". 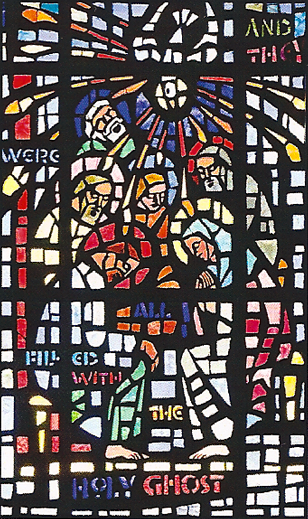 The sanctuary holds a number of stained glass windows, and as artists we expressed the stories of many of those windows through song, dance and drama. The dancers choreographed a piece on Creation in which I got to play water and Adam. During the rehearsal we had to pull a number of elements together in a short amount of time, continuing on our theme. In the moment of performance it all flowed seamlessly, and as the children came to the stage as flowers and trees and frogs I don't think I was the only one moved at a deep level. It set everything up for the rest of the service to be as powerful as it was. I led a bibliodrama for the window "By faith Abraham offered Isaac". Everyone did a marvelous job. The people who volunteered each had a good sense of humor, so it started out as a comedy. When the tone shifted, the more somber emotions of the story came through that much more powerfully. For the window "And they were filled with the Holy Ghost" I shared an excerpt from my play The Acts in which a character describes the Spirit falling on believers at Pentecost. A mix of dance, song and spoken word told the stories of the other windows, and by the end of the service I know that a powerful work went on at deep levels. Photos, which were a part of a beautiful printed program, are by Diane Lea. The service was imagined and designed by Tom Trenney, Director of Music Ministries, who graciously and beautifully portrayed Abraham in the bibliodrama.